Staff members may be contacted using our Contact Us page. Nina Krieger is the Executive Director, and formerly the Education Director and Curator, of the Vancouver Holocaust Education Centre. 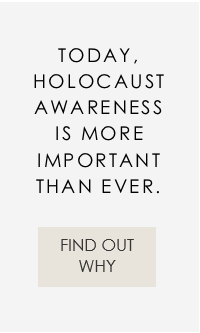 Nina has developed exhibitions, educational programs and pedagogical materials that challenge audiences to probe the complex historical, cultural and ethical issues raised by the Holocaust. Past curatorial projects include Canada Responds to the Holocaust, 1944-45, “Enemy Aliens”: The Interment of Jewish Refugees in Canada, 1940-43 and More Than Just Games: Canada & the 1936 Olympics. During her tenure as Executive Director, the VHEC has completed multi-year projects to support the preservation, access and educational use of the Centre’s collections, and renewed its facilties to support visitor engagement at a moment of transition for Holocaust education and remembrance. Before joining the VHEC, Krieger developed educational initiatives at the Contemporary Art Gallery (Vancouver), the London Consortium Summer School at Tate Modern (London) and Artangel (London). She holds an Honours degree in History from the University of British Columbia and a Master of Research degree in Humanities & Cultural Studies from the London Consortium, a multi-disciplinary graduate program of the University of London, the Architectural Association, the Institute of Contemporary Arts and Tate. Nina is a member of the Canadian delegation to the International Holocaust Remembrance Alliance and a Past Chair of the Memorials and Museums Working Group. She is a member of the Expert Committee on Countering Radicalization to Violence, advising the Canada Centre for Community Engagement and Prevention of Violence. Rome graduated from the University of Alberta with a Bachelor of Education Degree. While raising a young family, she began volunteering for the VHEC by serving on the Board of Directors, eventually serving as Secretary. In 1996 Rome was hired as Volunteer Coordinator, a new position to support the professional staff. The position grew into the position of Program Coordinator, followed by Acting Education Director in 2004 and in 2006 Rome was appointed Assistant Director. As of March 2018, Rome has served as Acting Executive Director. For many years Rome served as both co-chair and chair of the Yom HaShoah committee. Her parents were both Holocaust survivors. With nearly two decades of experience in sales, social enterprises and non-profit management, Jonathan graduated with honours from the University of British Columbia with a degree in Philosophy and is now completing a certification in Non-Profit Management at BCIT. He has worked for numerous non-profit organizations (including social enterprises) particularly in the Jewish community. Recently, Jonathan worked for Jewish Family Services in Vancouver as Development and Communications Officer and then for Hillel BC Society as Director of Operations, Administration & Finance. Ilona has been with the VHEC since 2016. She has been engaged in museum education, exhibition projects and community outreach in both the private and public sector on a national and international level for more than a decade. Ilona has worked as a researcher and research consultant for diverse initiatives in the context of history, art, and visual culture. She also has written books on historical topics. Ilona graduated with honours from the University of Basel (PhD) and from the University of Zurich (MA & BA), Switzerland, her native country. Thanks to a research scholarship by the Swiss government, she came to Canada as a visiting student at the University of British Columbia. Caitlin has served as Collections Registrar since 2017 and began working at the VHEC in 2015 as part of the team to design a custom collections management system. She graduated from Simon Fraser University with a BA in Humanities and Archaeology. She also holds a Library & Information Technology diploma from Langara College. Caitlin is interested in information architecture and public history. Shannon volunteered in the VHEC library starting in 2006, and was hired a year later as Librarian. Shannon holds a Master of Library & Information Studies degree from the University of British Columbia. She also has a Master of Arts degree in History from Western University and a Bachelor of Education degree from the Ontario Institute for Studies in Education of the University of Toronto. She has worked in education, museums and libraries for over a decade. Cathy Paperny has been the Vancouver Holocaust Education Centre’s Symposia Coordinator since 2015. She has been a volunteer docent at the VHEC for more than 10 years. Cathy taught elementary school for 10 years. She has a BEd, MA in social/cultural anthropology and is an Associate of the Royal Conservatory of Music in Speech Arts. Cathy is passionate about the importance of Holocaust education. Philip, President since July 2016, has served on the Board and Executive for more than ten years serving as Treasurer and Vice President. He also sits on the VHEC Planned Giving Committee which provides advice to prospective supporters. He has sat on many community boards including as Co-President of the Richmond Jewish Day School. Professionally he is a CPA, CA and runs a wealth management, estate planning and insurance practice at ZLC Financial. Happily married to Sherry (Gelfer) they have three wonderful children, Hayley, Joshua and Julia. Recreationally, he has coached youth soccer in Richmond including serving on the Board of the RYSA and also coached soccer for Maccabi Canada at the 2009 and 2013 Maccabiah Games held in Israel. He also enjoyed coaching at many JCC Maccabi Games held in North America and in the Galil in Israel in 2011. He still plays soccer and enjoys cycling and golf. Corinne is the daughter of Holocaust Survivors Henry Zimmerman (z”l) and Sally Zimmerman and joined the Board of the VHEC 6 years ago. She is married to Jonathan Festinger and is the proud mother of Jeremy, Dara and Avrel. Corinne is General Counsel with the federal Department of Justice, practicing in Aboriginal Affairs Portfolio with a focus on legal innovation. She is passionate about education and remembrance of the Holocaust. Marcus Brandt, whose grandparents were Holocaust Survivors, has served on the VHEC Board both as a Director and more recently as Treasurer. Marcus has lived in Vancouver since 2008, where he immediately became involved at the VHEC. Professionally, Marcus works as an Accountant at DMCL LLP, where he advises corporations, trusts, not-for-profit organizations and individuals on a wide range of accounting and tax related matters. Marcus also volunteers with Congregation Beth Israel, and with the Jewish Federation of Greater Vancouver. Al joined the VHEC Board in 2012. During his 30-year career in marketing and advertising, he had great successes on behalf of global and lesser known brands alike, including local and national not-for-profit organizations. As a son of Holocaust survivors and someone with a broad mix of friends, he believes VHEC’s work is as important today as ever. Ed was born and raised in Vancouver, the middle child of Holocaust survivors. An avid sportsman and community worker, he has served on many non profit Boards and is proud to have represented Canada three times at the Maccabi Games in Israel (Basketball). A lawyer, Ed runs his own business law practice in the city. He has been married to Debbie for 37 years and has two grown children. Norman Gladstone was born and raised in Saskatoon and moved to Vancouver with his wife Birgit and son Yosef in 1979. His business background is in the brewing, restaurant, hotel and wine industries. He joined the VHEC Board of Directors in the mid-1990s and has been involved ever since. Belinda is the Clinical Services Director at Rockdoc Consulting Inc. She possesses years of experience as a bedside nurse at St. Paul’s Hospital in Vancouver in HIV care, Acute Medicine and the Emergency Room, BC Children’s Hospital ER, and in the private sector. She has also worked as a Street Nurse on the Downtown Eastside of Vancouver and had extensive exposure to social issues, substance abuse, and violence prevalent in this community. Belinda later moved to an educator role as a Nursing Instructor at BCIT and Vancouver Community College. Belinda has her Bachelor of Science in Nursing from BCIT, and a Masters of Science in Nursing from UBC. Belinda’s passion for the VHEC developed after attending an open house during the 2010 Olympics. Following this she became a docent at the Centre which she continues to do today. Her devotion to the VHEC is inspired by the reaction she sees from the students visiting the Centre. She joined the VHEC board in 2015, and prior to this held a four year term on the Vancouver Talmud Torah School Board of Directors. Belinda was born and raised in New Zealand before moving to Vancouver. She is married and has two sons. She is an avid runner and sports enthusiast. Robert Krell is a child Holocaust survivor from Holland. He founded the audio-visual testimony project, the Holocaust Memorial at the Schara Tzedeck Cemetery and the Vancouver Holocaust Centre Society for Remembrance and Education of which he was the founding President and co-founded the annual Holocaust Symposium for high school students. He is professor Emeritus of psychiatry at the University of British Columbia. He has authored books and articles relating to the impact of the Shoah and continues to speak locally and internationally on the subject. Robert has received the State of Israel‘s Elie Wiesel’s Remembrance medal as well as the Governor General’s Caring Canadian award in recognition of Holocaust education initiatives. Shoshana Lewis joined the VHEC board in 2014. Both her father and grandparents are survivors of the Holocaust. Shoshana’s father Dr. Robert Krell is a founding member of the VHEC. Since moving back from New York with her family Shoshana has been involved with the VHEC, first as a docent and now as a board member. Professionally, Shoshana has been in the fashion business for over 20 years. She has owned and operated her own jewellery business for the past 15 years. Ian was born and raised in Australia. He earned a medical degree and practiced interventional cardiology, inventing a medical device (stents), and was bookmarked by the study of philosophy and political science in the ‘70s and more recently a Bachelor of Fine Arts degree at Emily Carr University, Vancouver. Ian’s art practice remains tethered to direct observation (studio or plein air), using visual journal, and direct mark making, painting outdoors or in the studio, to create responsive and synthetic images. Ian uses the media of monochromatic inks on paper, video, paintings, lithography as well as sculpture to create an immersive experience. He is invested in the nature of individual portraiture, the relationship between, and integration of, narrative with fixed and moving images, and the relationship between the observer and the observed. Robbie Waisman was fourteen years old when he was liberated from Buchenwald Concentration Camp on April 11, 1945. Born in Skarszysko Poland, he was the youngest of six children. Only he and his sister were still alive at the war’s end. Robbie immigrated to Canada as part of the Canadian War Orphans Project which saw the admittance of over 1,000 Jewish children to Canada. In 1948 Robbie began living in Calgary, and in 1959 he married and settled in Saskatoon. In Saskatoon he started a children‘s wear store and became active in the Jewish community. In 1974 he became president of B’nai B’rith where many charitable projects were undertaken in the general community at large. By 1976 he was President of the Saskatoon Jewish Community and served right up to his departure to Vancouver in 1978. In Vancouver Robbie has been involved in the hospitality industry though an accountant by profession. He managed a full facility hotel for 12 years, employing 85 men and women. He served the British Columbia and Yukon Hotel Association as treasurer for several years and subsequently became Vice-President before leaving the industry. Robbie also helped raise funds through the Variety Club of British Columbia to help underprivileged children. In 1983 Robbie began his active involvement with the Vancouver Holocaust Centre Society (VHCS). Robbie has served as Treasurer, Vice-President and President of the Vancouver Holocaust Centre Society. As an educator-speaker as part of the Survivor Outreach Program, he has shared his experiences of the Holocaust with thousands of students. He is in great demand as a speaker, speaking throughout schools in the lower mainland, and with Canadian Jewish Congress, has lectured to community groups in the BC interior and even Idaho. Robbie is the proud grandfather of two granddaughters. Yosef Wosk is an Adjunct Professor and Shadbolt Fellow in the Department of Humanities and was the Director of Interdisciplinary Programs in Continuing Studies at Simon Fraser University where he developed seminal programs such as The Philosophers‘ Café and The Canadian Academy of Independent Scholars. In addition to being an ordained rabbi and receiving two honorary doctorates, he holds Ph.D.s in Religion & Literature as well as in Psychology, and Masters degrees in Education and in Theology. Yosef founded and supported hundreds of libraries worldwide, endowed Vancouver’s Poet Laureate, and has lectured at institutes of higher learning in many countries. Identified as one of the top ten thinkers and most thoughtful citizens in the province, he is an appointed member of The Order of British Columbia, a recipient of both The Queen’s Golden and Diamond Jubilee Medals and included in Canadian Who’s Who. Active in communal affairs—especially in the areas of education, libraries, museums, the arts, social services, heritage conservation, gardens, philanthropy and religion—Yosef is a media commentator, public speaker and published author. As a businessman, he is president of both Binyan and Kolbo Holdings. Janos Benisz is a child survivor from Hungary. Born in 1938, Janos may be one of the youngest concentration camp survivors in Canada. At the age of six, Janos and his mother – along with 19,000 other Hungarian Jews – were rounded up and sent to Strasshauf, Concentration Camp in Austria. As he was being marched to transport, Janos saw his father and grandmother’s bodies lying murdered outside the family home. Janos spent 8-9 months in Strasshauf until the Russians liberated the camp. Afterwards, Janos and his mother returned to the family home. Later, one of Janos’ uncles took him to a Jewish orphanage in Budapest. He remained there until he was nearly 10 years old. His mother remained in their family home until she died in her 70s. Janos was sent to Canada at the age of 10 in 1948. He was adopted by a family in Winnipeg and ended up in seven foster homes, an orphanage and a reform school from ages 10-17. Janos became a newspaper reporter and worked for many papers including the Vancouver Sun. Amalia Boe-Fishman was born in Leeuwarden, the Netherlands on August 23, 1939. She survived the Holocaust as a child in hiding. After the Second World War, Amalia travelled to Israel where she met her first husband with whom she immigrated to Canada and had three sons. Amalia describes that she came to terms with her Holocaust experience while attending a Hidden Child conference in Israel. Today, Amalia is a devoted Survivor Outreach Speaker for the Vancouver Holocaust Education Centre and a member of the Vancouver Child Survivor Group. Lillian was born in Warsaw, Poland. In 1940, Lillian’s family was forced to move into the Warsaw ghetto. In 1942, after having narrowly escaping deportation several times, her father made arrangements for Lillian’s escape from the ghetto. Using a false identity, she went into hiding in several Polish villages for the remainder of the war. She was eventually reunited with her father and mother. Lillian’s family immigrated to Canada in 1947, living in Montreal and Victoria before settling in Vancouver. Lillian is the author of several volumes of poetry, as well as the award-winning trilogy of young adult novels: The Old Brown Suitcase, The Sunflower Diary and The Lenski File. She has also translated two volumes of poetry by Polish émigré writers, and worked as a creative writing instructor. Mariette was born in Brussels, Belgium, in 1935. She was the youngest of 11 children. Her father died when she was one-and-a-half years old. Her mother ran a grocery store. In an attempt to keep the entire family safe, Mariette’s mother registered them as Jews at the police station as she had been ordered to do by the occupying German forces. As tensions mounted, the family attempted to flee to Paris, but was turned back as the city was already under siege. Mariette’s brothers first took her to live with a family in a small town, where she attended a Catholic school and church. She was then moved around to many different places in order to escape the Gestapo, who were looking for people in hiding. On her seventh birthday, a woman took her to meet with her mother. Upon arriving at the meeting spot, Mariette saw her mother and brother being forced into a truck by German soldiers. The woman grabbed Mariette and turned her around to walk the other way. This was the last time Mariette saw her mother and brother. Mariette was placed in a convent, but was denounced by one of the nuns. She continued to be moved to different places throughout the war. While her sister was staying at an orphanage called Le Home des Hirondelles, she discovered that Mariette was at another orphanage nearby. The two sisters were soon reunited, and later found some of their other siblings. After the war, Mariette and her siblings decided to move to Canada together. Mariette arrived in Canada on November 17, 1947, when she was 12 years old. She was placed with a foster family and separated from her siblings. Mariette had a difficult time adjusting to her new life in Canada and ran away 12 times during her first year. Mariette eventually attended Point Grey High School in Vancouver, where she excelled in sports and music. She later graduated from Magee High School, and then went to business school. Mariette met her husband at the University of British Columbia, had three daughters and worked in the construction business. David Ehrlich was born in 1926 in Gherla, Transylvania (now Romania). In the early 1940s, David was not allowed to attend school and instead trained as a furniture maker. In spring 1944, at the age of 18, the Germans forced the Jewish community to form a ghetto in a large field. A month later, David and his family were deported to Auschwitz, where he was selected to work in a furniture factory. In February 1945, David was marched and transported to Mauthausen concentration camp and then to Melk concentration camp, where he worked in an underground munitions factory. He was then marched to the camp at Ebensee and was liberated there by Americans. Six months later, he escaped to Paris and came to Canada as a war orphan in 1947. He married and moved to Saskatchewan in 1952. David is now a retired businessman, a proud grandfather and lives in Vancouver. Serge was born in Târgu Ocna, Romania, on July 23, 1928. In 1936, he moved to Iași with his mother, father and younger sister, where there was a well-established Jewish community. His father was involved in wholesale pharmaceuticals, and Serge attended a secular school for the first four grades. By the early 1930s, the population had become increasingly hostile toward Jews. When the war started, Serge was no longer able to attend public school and instead attended a Jewish school set up by the community. In late June 1941, Serge witnessed a massacre of Jewish citizens in the streets. Serge’s family barricaded themselves in their home and survived the pogroms in which thousands of Jews perished. After the pogrom, life for Serge’s family returned to “normal”: Serge and his family, like all the Jews of the area, were made to wear armbands with the Star of David and, like people throughout the region, faced wartime food shortages and deprivation. In August 1944, Iasi was occupied by Soviet troops and Serge was able to return to school. His father decided they should move to Bucharest and he bribed a Jewish Soviet officer to assist them. Serge finished high school there and began to study pharmaceuticals. By September 1947, Serge had become a radical anti-communist and had to leave the country. He and his father travelled to the Hungarian border where Serge crossed on foot. He spent the next year illegally crossing the borders of Austria, Italy, and France. In Paris, Serge trained as an ironworker. He obtained a visa to Cuba, where he spent two years working for a pharmaceutical company in Havana. He moved to Montreal in 1950. His parents followed in 1953, and his sister in 1956. Eventually, Serge moved to Vancouver where he was married and had three children. Jannushka was born in Paris, France, in 1933, into an assimilated Jewish home. At the time of the invasion of France in 1940, she was six years old. Forced to wear the yellow star, Jannushka faced beatings and insults from her classmates and was eventually removed from school by her parents. In the summer of 1941, a French policeman warned her father that the family faced arrest and deportation. This motivated them to seek hiding places. At that time, Jannushka and her brother were sent to a small village in northern France. They lived in hiding until they were liberated by the American armed forces. After the war, Jannushka was reunited with her parents. At the age of 19, she left France to travel and worked for the United Nations, before settling in Vancouver. Chaim was born in Hungary in 1926. The youngest of eight children, Chaim’s family was poor and very religious. When the Germans entered the city, Chaim’s family was ordered into a ghetto. After four weeks, Chaim was transported to Auschwitz and then to Mauthausen, a forced labour concentration camp. Chaim ultimately survived the camp, despite becoming so ill that he could not walk. Chaim went to live in Israel and in 1954, Chaim moved to Saskatoon where he become a Jewish school principal and studied law. Robert Krell is a child Holocaust survivor from Holland. He founded/co-founded the annual Holocaust symposium for high school students, the audio-visual testimony project, the Holocaust Memorial at the Schara Tzedeck Cemetery and the Vancouver Holocaust Centre Society for Remembrance and Education of which he was the founding President. He is professor Emeritus of psychiatry at the University of British Columbia. He has authored books and articles relating to the impact of the Shoah and continues to speak locally and internationally on the subject. Robert has received the State of Israel’s Elie Wiesel’s Remembrance medal as well as the Governor General’s Caring Canadian award in recognition of Holocaust education activities. Claude Romney is a child survivor from France. Claude Romney was born in Paris a few months before the beginning of the Second World War. Her father was arrested on December 12, 1941 during a large roundup of Jewish intellectuals, and interned at Compiègne, a transit camp north of Paris. He was deported to Auschwitz on March 27, 1942 with the very first convoy from France, which was also the first from Western Europe. Miraculously he survived, thanks to a combination of factors, the most important of which were luck and the fact that he was a doctor. After almost 34 months in Auschwitz and a Death March, he spent another 3 1/2 months in Mauthausen and Ebensee where he was liberated by the American Army of France. Claude and her mother spent most of the war years as refugees in a small town in the south of France in the Pyrénées Mountains, where her father joined them at the end of May 1945. Claude holds a Ph.D. from the University of Paris VIII. She taught at universities in France, England and Canada and is now Professor Emerita of French at the University of Calgary. Her publications include topics ranging from Applied Linguistics to French Canadian Literature, particularly the great writer Gabrielle Roy, as well as the Holocaust. She has just finished writing a book on the written testimonies of fifty-seven former Auschwitz prisoner-doctors. She immigrated to Canada with her British born husband and has been living in Vancouver since 2004. She is a member of the Child Survivors’ group in Vancouver and also sits on the Executive. She is also one of the VHEC’s devoted Outreach Speakers and talks to students, including French Immersion students, about her wartime experience and her father’s story. Born and educated in Romania, Martha Salcudean is a survivor of the Bergen-Belsen concentration camp in Germany. She and her family came to Canada in 1976. She was Professor at the University of Ottawa until 1985 when she was appointed as Head of Mechanical Engineering at the University of British Columbia, the first woman in Canada to hold such position. She continued her career as Associate Vice President Research and Professor and Weyerhaeuser Industrial Research Chair in Computational Fluid Dynamics at UBC. She is currently a Professor Emerita and still involved in research. Martha received the BC Science Council’s Gold Medal in Science and Engineering in 1991, the Engineering Institute of Canada’s Julian C. Smith Medal in 1995 for “Achievement in the Development of Canada”, the National Izaak Walton Killam Memorial Prize in Engineering in 1998 and the Order of British Columbia in the same year. She became an Officer of the Order of Canada in 2004. She is an Honorary Doctor of the University of Ottawa, University of British Columbia and University of Waterloo. Since 2014, Martha has been a Holocaust Survivor Outreach Speaker at the Vancouver Holocaust Education Centre and has spoken to a large number of students about her experience during the Shoah. Louise Stein Sorensen was born in 1929 in Rotterdam. In 1936, her parents, older sister and she moved to a large villa on the outskirts of Amsterdam. Her father owned a fur coat factory. In 1939/40 they made several unsuccessful attempts to emigrate – they missed getting on the fully booked Simon Bolivar, destined for Curacao – which departed just in time before May 10, 1940 before the Germans invaded the Netherlands. This ship was torpedoed, and everybody drowned; then they booked on the next available sailing, but it was due to leave in late May, so they were trapped. The persecution of the Jews started soon thereafter. From the summer of 1941 on Jews were no longer allowed to attend non-Jewish schools. Louise had just completed grade 6 at a Montessori elementary school. From April 1942, the family had to wear yellow stars on their clothing, and by June the Nazis forced them out of their home and into a low rental apartment in the Jewish part of Amsterdam. Soon after, the roundup and the deportation of Jews occurred all around their part of Amsterdam and fear and horror became a daily experience for them. In the fall, the family learned that most of their relatives: grandparents, uncles, aunts, cousins, including her almost 96-year-old great-grandfather and her 5-year-old cousin, had been arrested and deported. They never saw them again. Likely to be arrested at any time, in early 1943, Louise, 13, and her parents decided to try and find places to hide. This was by no means easy, but eventually all four of them were taken to separate hiding places outside of Amsterdam. Arie Pluysier who was the non-Jewish husband of her mother’s cousin, helped them find places to hide. In the course of the first six months Louise was moved to about six different addresses, always a few steps ahead of the pursuing Nazis. In order to survive she always had to stay indoors and hide her true identity. She was given many unfamiliar chores and she had to learn how to do many things very quickly. Louise felt unwelcome and withdrew into a shell. By 14, Louise had ended up in the east of the Netherlands, in a small farm workers house on the outskirts of Apeldoorn. Her parents soon joined her there. For over twenty months Louise rarely left the attic that was their hiding place. For safety reasons she had no access to books or writing materials and no contact with persons other than the four adults in the house, therefore diary writing was out of the question. After hiding for a total of more than 2 1/2 years her and her family’s liberation came on April 17th, 1945 by way of Canadian army units. A few weeks later the family made their way back to the area of Amsterdam, where they were rejoined by her older sister who had been hidden elsewhere in the country. Louise served on the VHEC’s Board of Directors for many years. Peter was born in Hungary on August 30, 1935. His father was a musician and his mother worked as a secretary. His mother came from a wealthy family and Peter recalls a very happy childhood with close family relationships. With the onset of the Hungarian-German alliance in 1942, life for Jews became increasingly difficult. Discriminatory laws were introduced that prohibited Jewish children from going to school. In 1944, Peter’s mother was arrested by the Gestapo while attempting to stop a raid at the business where she worked. He would later discover that his mother died in a concentration camp — most likely Auschwitz. His father was deported to Nazi Germany to work as a forced labourer, so Peter was sent to live with an aunt. When the Budapest ghetto was established, Peter was taken to a home in a rural part of Budapest with the help of the International Red Cross. With his blond hair and blue eyes, Peter looked Aryan, and he lived among a group of Christian children, always moving from building to building due to the constant bombings. At the end of the war, Peter was reunited with his aunt and uncle. His father also survived the war and they moved to Vienna where they became displaced persons. The following year, Peter was sent to an exclusive boarding school where he experienced continued antisemitism. In 1948, Peter and his father immigrated to New York where Peter attended high school in Harlem. Peter subsequently won a scholarship to Queens College, but dropped out in order to join the army, as had been the tradition in his family. After the army, he returned to college and graduated with a PhD in psychology from Princeton University. He worked at the University of Illinois, and at Rutgers University and the University of British Columbia as head of their Departments of Psychology. Tom was born in Budapest, Hungary, on May 19, 1935. All four of his grandparents were assimilated Jews. His mother had been raised as a Protestant, and his father converted to Christianity as a teenager in order to attend medical school. After Hungary was occupied in 1944, however, Tom’s family was considered Jewish by the Nazi authorities, and were forced to wear the yellow star. Tom’s father was no longer allowed to practice medicine and was held in a detention centre. He was then deported by train, and forced to march to Mauthausen. Tom’s father survived the gruelling march, but died from typhus just before liberation in April 1945. Tom’s remaining family had been arrested and taken to an assembly area in an old school. The next day, a family friend who belonged to the Hungarian Nationalist Socialist party, the Arrow Cross, pretended to arrest them and took the family to the ghetto where they would be safer. Tom was in the ghetto from October 1944 until liberation in February 1945. After liberation, the family went to live with surviving relatives in Transylvania, but Tom had a difficult time both emotionally and psychologically. In 1947, he moved to Switzerland to live with his aunt and uncle, who adopted him. He came to Canada in 1951 and was joined by his mother and younger brother in 1956. Tom studied engineering and geology and became a teacher before switching to civil service. He settled in Vancouver in 1974. A Child Survivor born in Rumania and a founding member of the VHEC, Rita has been involved with the Society since its inception. She has served in numerous capacities, including on the Board of Directors as Vice President, President and Past President; on the Nominations committee, Life Fellow committee, and Symposium committee, as well as the coordinator of our Outreach Speakers program for many years. Rita’s dedication to the community has been recognized time and again. For example, as a result of the VHEC’s nomination, she won the YWCA’s Woman of Distinction award in the category of Voluntary Community and Humanitarian Service. Her warmth and kindness serve as an inspiration to the VHEC staff and her fellow Board Directors. Always there to lend a hand, or to bake delicious goodies for symposia, meetings and luncheons, Rita exemplifies the meaning of community service. Lauren Faulkner Rossi is an Assistant Professor of History at Simon Fraser University. She has taught modern German history and Holocaust and Genocide Studies courses in the United States and Canada. She has been involved with the Holocaust Educational Foundation for more than a decade and is currently working on articles about the cultural causes of genocide and the Holocaust, war, and gender. Professor Chris Friedrichs is a Professor Emeritus of History at the University of British Columbia, where he taught European and world history for 45 years. He is a specialist on German history. His most recent book is titled A Jewish Youth in Dresden: The Diary of Louis Lesser, 1833- 1837. Professor Friedrichs has been involved in Holocaust education activities in Vancouver for many years. Sebastian Huebel completed his PhD in History at the University of British Columbia. He received his B.A. at TRU in Kamloops (2007) and his Master’s degree at the University of Victoria in 2009. Sebastian is currently an instructor at Simon Fraser University and Alexander College. Kit Krieger has been a Holocaust educator for more than 40 years. He is a past president of the BC Teachers’ Federation and Registrar of the BC College of Teachers. He was the Executive Director of the BC Principals’ and Vice-Principals’ Association for six years. In 2003, Kit was awarded the Kron Sigal Award for Excellence in Holocaust Education and in 2015, was named one of the Education 100 in commemoration of the 100th anniversary of UBC. Adrian Myers holds a BA in History from UBC, an MA in Historical Archaeology from the University of Bristol, and MA and PhD degrees in Archaeology from Stanford University. As a student, Dr. Myers studied underground economies in Auschwitz and other concentration camps and received the prize for best History Honours student of the year (2006).